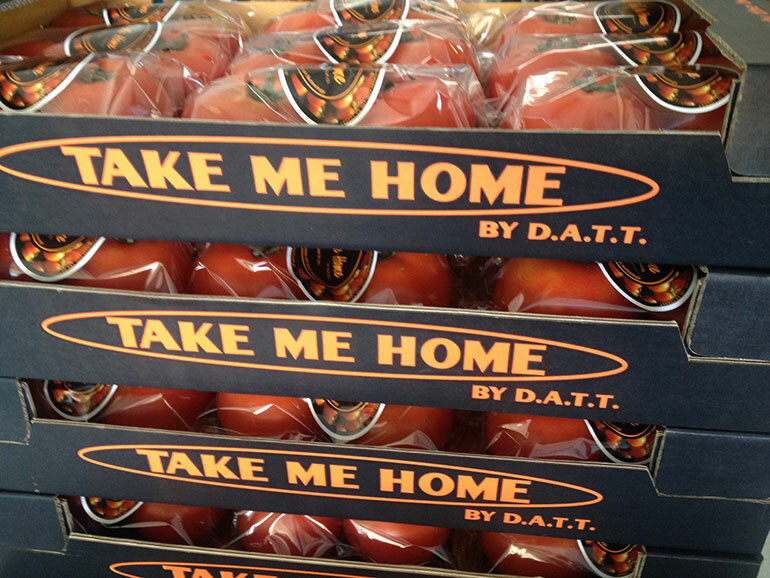 The brand ‘Take Me Home Tomatoes’ was launched by D.A.T.T. in 2005. It was initially formed to bridge a gap between local Thai farmers and high-end retail supermarket chains. The introduction of ‘Take Me Home Tomatoes’ meant that the high-end supermarkets could source their quality tomatoes locally instead of having to import them. Now 10 years into this concept, we are one of Thailand’s biggest tomato producers, supplying most high- and low-end supermarket chains in the country. A batch of Take Me Home Tomatoes ready for delivery. – Heirloom cherry tomato mix. Our customers can find our Take Me Home tomatoes in Tesco Lotus, Tops, Big C, The Mall, Chiang Mai’s Rimping supermarket and quite a few smaller names. Common questions about Take Me Home tomatoes? Why choose Take Me Home tomatoes? Tomato should not only look like one… it should taste like one! In contrast with most tomato producers we, at Take Me Home Tomatoes, harvests our tomatoes only when they are fully matured and red, which ensures you that our tomatoes have developed their renowned rich flavor and sweet taste. I want to be sure that what I feed myself and my family is safe! On our tomato farm, we only use the most reliable and safest (biological) crop care methods to ensure our customer, but also ourselves a healthy product and working environment. I want to purchase my Take Me Home tomatoes year round! Whereas a lot of tomato farmers grow a seasonal crop, Take Me Home grows tomatoes 365 days of the year. This means that our customers can purchase Take Me Home tomatoes any time anywhere! I want my tomatoes to be fresh! Because we harvest our tomatoes fully ripened, our products’ shelf life is limited to a week or more. That is why we harvest our tomatoes 6 days per week… making sure your Take Me Home tomatoes are always fresh! We restock the supermarkets 2, sometimes even 3 times per week.